The Laura Ashley CX155LA is a popular computerized sewing machine that offers built-in fonts, basic monogramming and doubles as a home quilting machine. This limited edition model is highly rated, and it’s easy to see why so many users love this model. Before we delve deeper into our review of the Laura Ashley CX155LA, let’s take a look at the machine’s features and specs at a glance. This is what makes up the base features of this limited edition model. Now let’s take a look at how this model performs under real usage. When unboxing this machine, you’ll find that a lot has been included to make sewing and quilting a breeze. This model comes packed with everything you’ll need, including an accessory bag, foot controller, oversized table and a slew of accessory feet. New and advanced seamstresses alike will find that Laura Ashley has not skimped on the accessories included. Sewing machines used to be defined by their difficulty to use and setting up. Your grandmother may have told you about the joy of threading a needle, but she was lying when she said it was fun. No one likes pricking their finger when threading a needle. Thankfully this is no longer an issue. The model’s advanced threading system makes threading this machine a breeze. Users only have to touch a lever on the side of the machine and it will thread the needle for you. It’s so easy that it feels like cheating, but it definitely beats stabbing your finger. Bobbins feature the drop-in style from the top. This allows for the quick-set, top-load bobbin that is exclusive to Brother. Yes, this machine is a Laura Ashley, but it’s designed by Brother. This allows you to enjoy some of the world’s most advanced features and the utmost in quality. The bobbin stays in place and is reliable. A jam-resistant mechanism is in place, too, which ensures jams are kept to a minimum. It takes just minutes to be able to set up the thread and bobbin to be able to use this sewing machine. There are 155 stitches, so you’ll have stitches for every occasion. What’s really nice is that all of the stitches are laid out on a diagram on the front right of the machine so that you can find and choose them with ease. A backlit digital display allows you to choose the stitch you want by number. Included in the stitch count is 10 different 1-step buttonholes. These holes allow you to add buttons to your project with ease. And there is one font stitch available, too. The remaining stitches are all basic and specialty stitches. Right on the front of the machine you’ll be able to choose speed controls, and there is also an included pedal that will allow you to control the sewing speed with your feet. In terms of stitches, you have enough options for virtually any project you’ll ever undertake. Any project you throw at this machine, it will be able to tackle with ease. And this is what is really important in a versatile sewing machine. 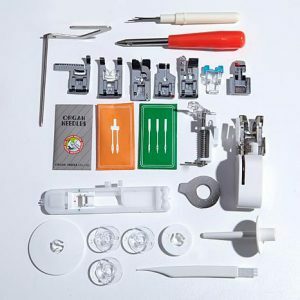 Tension settings can be adjusted, and the needle position can also be adjusted to allow you to have complete control over the sewing experience. When you want to quilt, you know that you need an extra-wide space to be able to work with larger quilts. A small workspace seen in a normal sewing machine is far too small for quilting needs. But this limited edition model has an extra-wide table that is 33% larger than a normal workspace. 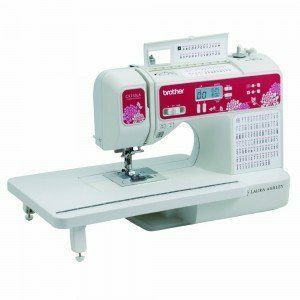 The larger table allows users to be able to sew and quilt with much greater ease. And the built-in lighting can be clicked on with a button to illuminate the entire table, so you can easily follow pattern lines. There are also measurements on the table itself that allow you to quickly work through patterns. You can make king-sized quilts on this machine’s table. It’s large enough for quilting and perfect for larger patterns. Want to sew your own blanket? No problem. The lighting is on the dimmer side, but it does it’s job well. This machine is very affordable despite being one of the better computerized sewing machines in this price range. An issue is that a lot of the parts are plastic, so this wouldn’t hold up to the same quality of sewing machines in the 50’s that were made with steel and metal. Some sewing machines are still made with steel, but they’re very expensive. My only other complaint was that the light was dim, but every sewing machine seems to suffer from this issue. It allows for just enough lighting, so there isn’t too much to complain about. And we almost forgot the most important thing – a 25-year warranty. If this sewing machine does break, you can return it to have it repaired under the 25-year warranty. Customer service numbers are also provided for free that allow users to be able to get in contact with a real person, which is something most other manufacturers don’t offer. 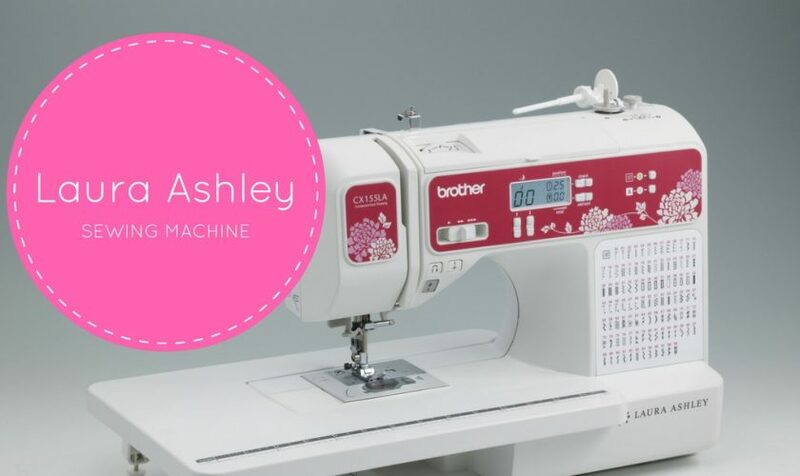 The Laura Ashley Limited Edition sewing machine offers quality, function and control all packed into an affordable machine. 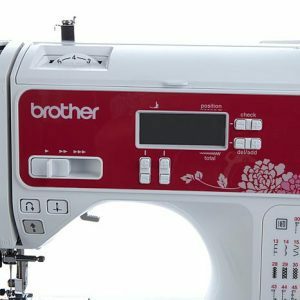 If you’re in the market for a budget-friendly computerized sewing machine, Laura Ashley offers one of the best options. => Click here to learn more about this Laura Ashley sewing machine.